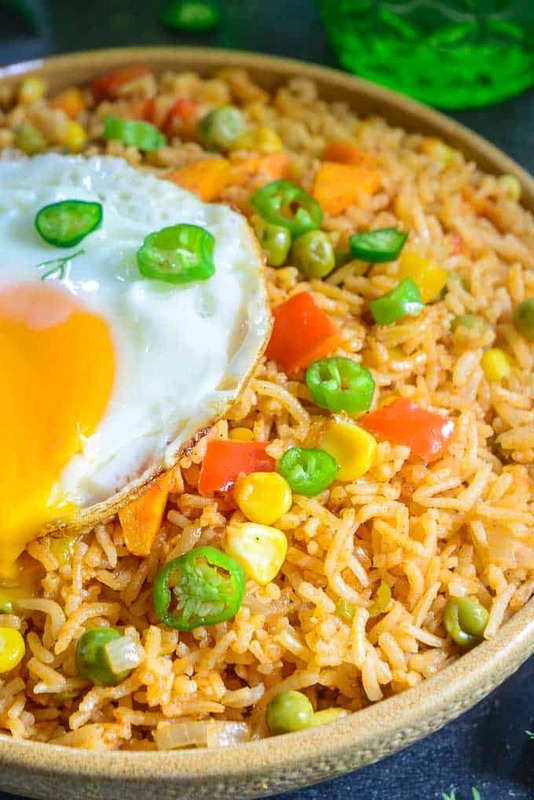 Mexican Rice is a delicious spicy rice based dish loaded with Mexican flavours. It is full of vegetables and other healthy ingredient and is fantastic to make for family meals. Check out my easy, homemade recipe to make this dish in an authentic style. 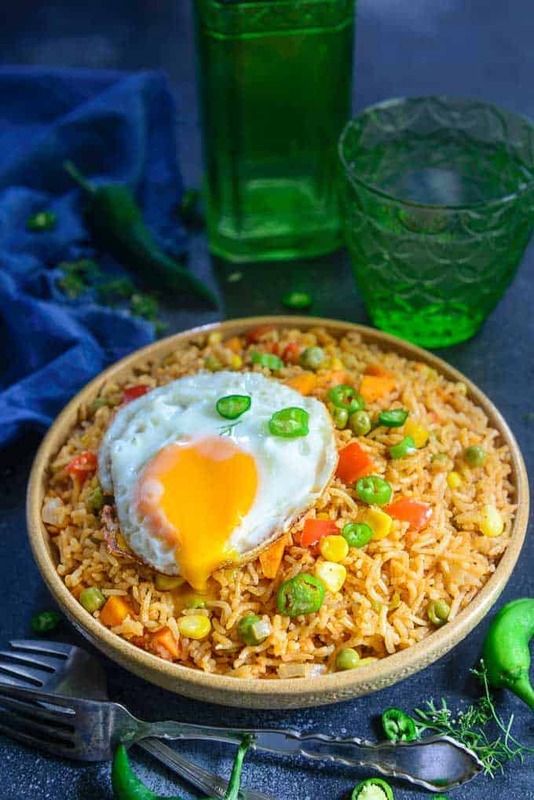 Here is how to make Mexican Rice Recipe. Do try it soon if you love vegan, vegetarian Mexican meals. Mexican cuisine use a lot of corn, beans, avocados, fresh tomatoes, chillies, and rice. You must have surely heard about tacos and quesadillas, they are quite popular snacks of Mexican Street Food. We look forward to savouring a nice Mexican dish on a regular basis at our home. 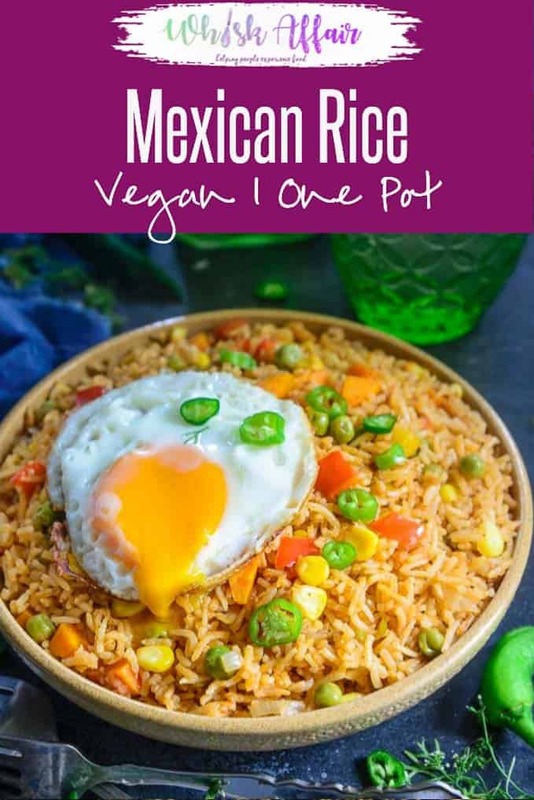 One Pot Mexican Rice pretty much makes for a promising meal and satiates our taste buds as well. The turnaround time for this rice recipe is quick. Hence, it is sure to become your family favourite meal. 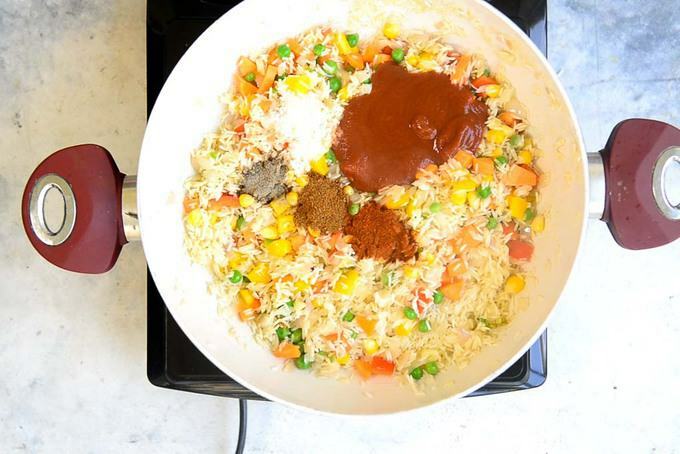 Provided that you have all the ingredients set by your side, preparing Mexican Rice hardly takes 20 minutes. This dish is so convenient to make on the weekdays that it easily sorts our dinner plans! 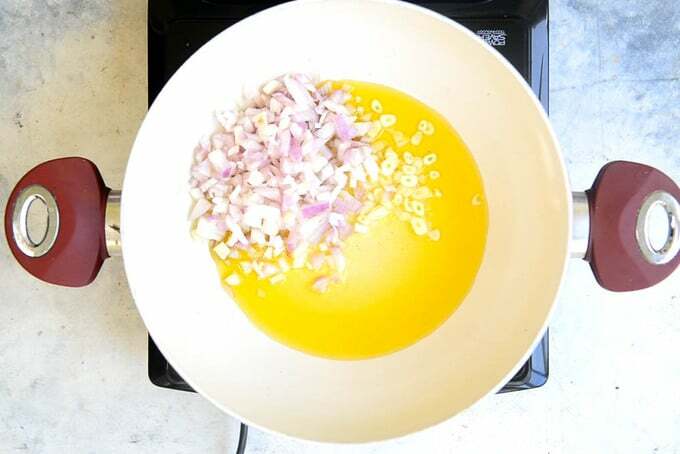 I have tried this recipe many times because cooking the rice and mixing it all up is an easy breath. Mexican Rice is a spicy rice dish where the grain is cooked along with Mexican Flavours like Jalapeno Peppers, Corn, Tomato Puree etc. It’s a one pot meal and makes for a great vegan, simple and quick homemade lunch or dinner. How to make Mexican Rice in Rice Cooker? How to make Mexican Brown Rice? Brown rice needs more liquid to cook as compared to white rice. So instead of adding double liquid, make the quantity of liquid, 3 times that of rice. Keep the rest of the recipe same. 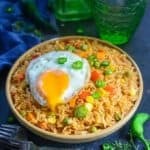 How to make Recipe for Mexican Rice healthier? I add lots of fresh veggies such as peas, corn, peppers, Jalapeno while preparing Mexican Rice recipe. You can also make a chicken version of this rice by adding some grilled chicken in the rice and also use brown rice to make it healthier. Making it using cauliflower rice is also a great way to healthify it. 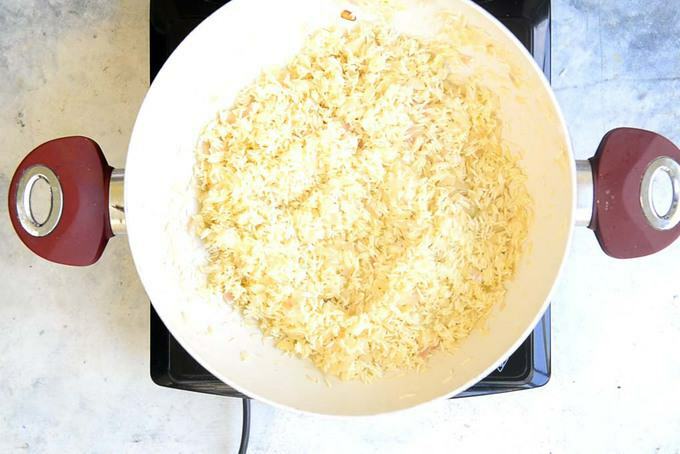 Here is a detailed recipe of how to make Mexican Cauliflower Rice. You can replace rice with quinoa too and make Mexican Style Quinoa. Even couscous works great in this recipe. Mexican Couscous is my family’s fav too. How to use Mexican Rice? Mexican Rice works as great meal in itself. You can use it for filling burritos or fajitas. Serve it with some roasted tomato salsa for a delicious combo. 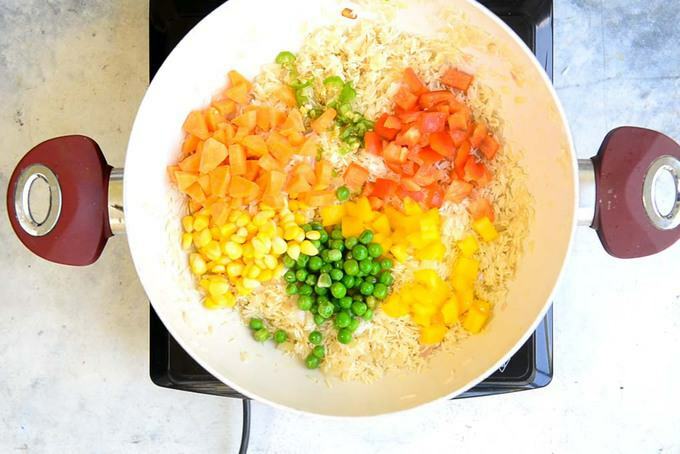 Add the rice and fry for 3-4 minutes, until it absorbs the oil. Keep stirring gently. 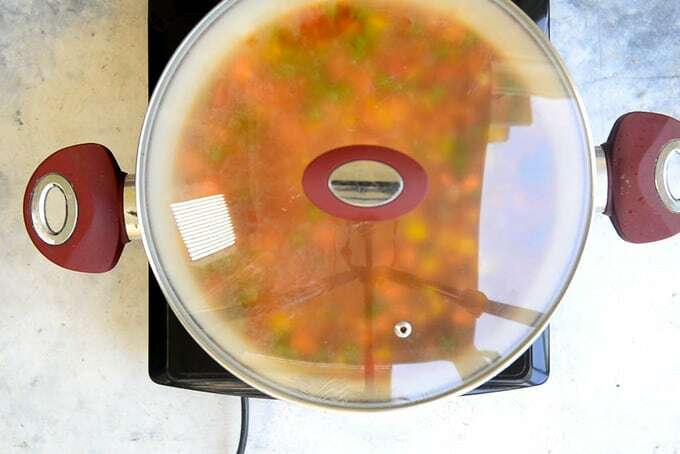 Add Jalapeno pepper, bell peppers, peas, corn and carrot and cook for 2-3 minutes. Add tomato puree, salt, pepper powder, cumin powder and paprika along with 3 cups of stock. Cover the pot and cook the rice on low heat till done. Mexican Rice is a delicious rice based dish. 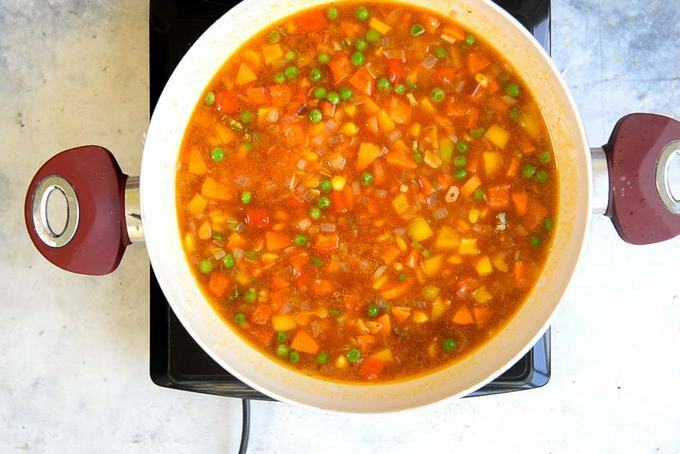 Full of vegetables and other healthy ingredients, this is fantastic to make for family meals. Add the rice and fry for 3-4 minutes, until it absorbs the oil. Looks delicious! Can’t wait to try it! A quick question though, do we have to add the water in addition to the stock? A total of 6 cups of liquid to 1&½ cups of rice? Hi Shireen. Thnx for noticing the error. I have updated the recipe. Thnx again.